Season 4 of Orphan Black premiers, Thursday, April 14 on BBC America at 10PM Eastern…set your DVR. I'm a Clone Club fan so I'm looking forward to its return. 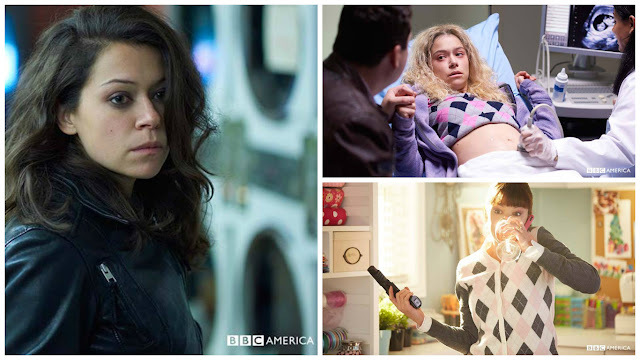 The multi-charactered Tatiana Maslany is great fun to watch. Check out the trailer below. Returning this season is Jordan Gavaris as Sarah’s battle-worn foster brother Felix; Maria Doyle Kennedy as Sarah and Felix’s foster mother Mrs. S; Kristian Bruun as Donnie, Alison’s partner-in-crime and husband; Kevin Hanchard as Art, Beth’s detective partner who’s torn between his job and his loyalty to the clones; Skyler Wexler as Sarah’s long-suffering daughter Kira; Ari Millen as a mysterious new Castor clone, the likes of which we’ve never seen before; and Josh Vokey as Scott, Cosima’s lab partner. Also returning this season is James Frain as Ferdinand, an intimidating “cleaner” for shadowy organization, Topside; Allison Steadman as Kendall Malone, “the original”; and Rosemary Dunsmore as Susan Duncan, Rachel’s adoptive mother and one of the leading scientists of Project Leda. Joining the Orphan Black cast this season is Joel Thomas Hynes as Dizzy, an edgy, self-reliant hacker who doesn’t conform to group mentality.